Red-winged blackbirds from Arkansas were studied at the University of Georgia. 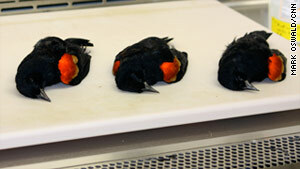 (CNN) -- Experts believe a loud noise or event was behind the mass death of as many as 5,000 red-winged blackbirds and starlings in Arkansas on New Year's Eve, when they all flew into buildings at night, veterinarian Dr. John Fischer said Wednesday. Fischer, of the Southeastern Cooperative Wildlife Disease Study in Athens, Georgia, said the bang startled very large roosts in a square-mile area in Beebe, Arkansas, 40 miles northeast of Little Rock. Agreeing with this finding later Wednesday was the U.S. Geological Survey's National Wildlife Health Center in Madison, Wisconsin, whose preliminary test results showed that the red-winged blackbirds died from blunt-force trauma. The report supported preliminary findings from the Arkansas Livestock and Poultry Commission released Monday. Necropsies on the carcasses at the Wisconsin lab revealed internal hemorrhaging, according to a Arkansas Game and Fish Commission statement. Tests showed no pesticides, and results are pending for additional chemical toxins and infectious diseases, authorities said. Unusually loud noises, reported shortly before the birds began to fall, caused the birds to flush from a roost, and New Year's Eve fireworks in the area may have forced the birds to fly at a lower altitude than normal, causing them to hit houses, vehicles and trees, the commission's statement said. Blackbirds have poor night vision and typically don't fly at night. The collisions caused internal trauma, Fischer said. "At this stage of the game, I don't see anything that will alarm me or precipitate alarming the public at all," Fischer told CNN. Karen Rowe, an ornithologist for the game and fish commission, said this week such incidents are not that unusual and often are caused by a lightning strike or high-altitude hail. A strong storm system moved through the state earlier in the day Friday. Officials have also speculated that fireworks shot by New Year's revelers in the area might have startled the birds. In a separate incident 450 miles south of Beebe, some 500 red-winged blackbirds, starlings and sparrows were found dead Monday morning on streets in the southern Louisiana community of Labarre. Fischer told CNN Wednesday that X-rays of those birds found hemorrhaging consistent with traumatic death, and the birds apparently flew into stationary objects and power lines. Michael Seymour, a Louisiana Department of Wildlife and Fisheries ornithologist, said he would not relate what happened to Arkansas to what happened in Louisiana. "On the outside, it's obviously pretty easy to link them together and find the pattern there, but as of now, there is absolutely no linking besides some of the species involved," he said. Seymour said these preliminary results tend to point toward some sort of collision or traumatic event as opposed to a virus or bacterium. "We obviously have to wait on final results," he said. "We're still waiting on the toxicology reports, which could take weeks." Seymour said there is a "pretty good chance" the bird hit power lines. "It's the No. 2 killer in the U.S.," Seymour said. CNN's Vivian Kuo contributed to this report.